Lock in a great price for Holiday Inn Daytona Beach LPGA Boulevard – rated 9.1 by recent guests! The room was nice and clean and comfortable. The staff was very nice. All was well. The woman at the desk, Shay, was very pleasant. Other than that, nothing. I always stay here when I'm in Daytona, I love it!! Becky the bartender/server was very friendly, she made it Very enjoyable! Variety of choices. The food, the service, the cleanliness, location and price were just right. Newer property right next to 95 and just minutes away from Daytona Motor Speedway where we were kart racing. Breakfast delivery to the room. Pull out sofa bed. One day there was no one to cook breakfast that I paid for, also my room was a lil warm asked for a fan, they didn't have one , other then that holiday inn is my place. This was the best Holiday Inn I have ever stayed at. Felt like a high end hotel. Staff was so friendly and helpful. They would try to accomodate you all the time. All staff members from front desk, restraunt, to house keeping. Holiday Inn Daytona Beach LPGA Boulevard This rating is a reflection of how the property compares to the industry standard when it comes to price, facilities and services available. It's based on a self-evaluation by the property. Use this rating to help choose your stay! Offering an outdoor pool and an on-site restaurant, this hotel is located in Daytona Beach, FL. Free Wi-Fi access is available. Tanger Outlet Daytona is 1.7 mi from the property. A microwave and refrigerator are included in each room at Holiday Inn Daytona Beach LPGA Boulevard. A flat-screen TV and hairdryer are available. A tennis court and fitness center are on site at the LPGA Boulevard Holiday Inn. Other offerings include meeting facilities, dry cleaning, and an ironing service. Daytona International Airport is 9 minutes’ drive from this hotel. Guests will be 7 minutes’ drive from Daytona International Speedway. This property is also rated for the best value in Daytona Beach! Guests are getting more for their money when compared to other properties in this city. When would you like to stay at Holiday Inn Daytona Beach LPGA Boulevard? This room includes a microwave, refrigerator, and cable TV. 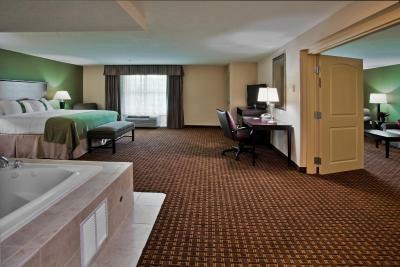 This accessible suite includes a microwave, refrigerator, and cable TV. This suite includes a microwave, a refrigerator, and cable TV. House Rules Holiday Inn Daytona Beach LPGA Boulevard takes special requests – add in the next step! Holiday Inn Daytona Beach LPGA Boulevard accepts these cards and reserves the right to temporarily hold an amount prior to arrival. The Breakfast Included rate includes a breakfast coupon worth $20 per room per day. So accustom to free breakfast. Went to McDonalds. Well when we went down for breakfast we were told that we couldn’t order from the menu and that the breakfast bar was the only thing we could get which was $10.95 per person. The waitress was very apologetic. Once the cook came through she asked him about ordering from the menu he said No! He seemed to be in a foul mood. We were so disappointed and were about to leave to go somewhere else to eat but we were pressed for time. There s a full sign in front of the restaurant advertising Breakfast full menu and Breakfast Bar available every morning. Older hotel. Rooms could use updating. Food in breakfast buffet wasn’t hot enough. Everything was great. Close to the track, easy to get to. Breakfast and dinner meals were delicious. It was clean, comfortable and we'll be back.